Twenty minutes north of South Africa’s beautiful Cape Peninsula, you'll find yourself travelling through the undulating wheat fields and vineyards of the Swartland. Lush fruit plantations, expansive protea farms, vistas of natural veldt flowers and rolling pastures grazed by sheep and cattle complete a picture-postcard kind of beauty. Sandwiched between the rich Swartland and the coast is another kind of landscape, not nearly as obviously pretty: the Sandveld. It is so named because of its sandy soil. It was, not too long ago, the seabed. It is here that artist Annelie Venter looks after the hardy sheep and cattle on her farm, takes her photographs and paints her pictures. The story that Insect Traces whispers, what is it? The painting immediately reminded me of the meandering journey the Israelites made between Egypt and the Promised Land. For forty years they wandered in the desert. Forty years and they got nowhere! That’s really frightening. A lifetime of not getting anywhere! And yet God was watching over them, providing for them, guiding them, waiting for their slave-mentality (how often they looked backwards, complaining!) to die away until those born for freedom could take hold of their inheritance. The artist’s loving attention to detail with deft and gentle strokes of her brush seems to me a metaphor for God’s eye. Nothing escapes him. Nothing is unimportant. He is not uninvolved and far away. He is present. He is acting. Annelie says, ‘If you take photos at random there is always balance and rhythm to be found. I only paint the truth, never rearranging anything.’ The way things are right now in my life, is the way they need to be under God’s direction. As he led the Israelites, he will lead me. I might seem to be going around in circles here and there, but I am getting where I’m meant to be. We are born for freedom, but our fears and unbelief often keep us from stepping into the wider space that God has given us. Yet he patiently waits, he keeps his loving eye attentively upon us and he teaches us. Our every life experience is part of his perfect plan. He’ll never let go until we have shed every shred of the old life’s skin and can emerge as new creations in Christ. Nothing is random, nothing is accidental. If an artist finds beauty in a small patch of barren Sandveld, is there not beauty too in my life with its many ‘wrong’ turnings? 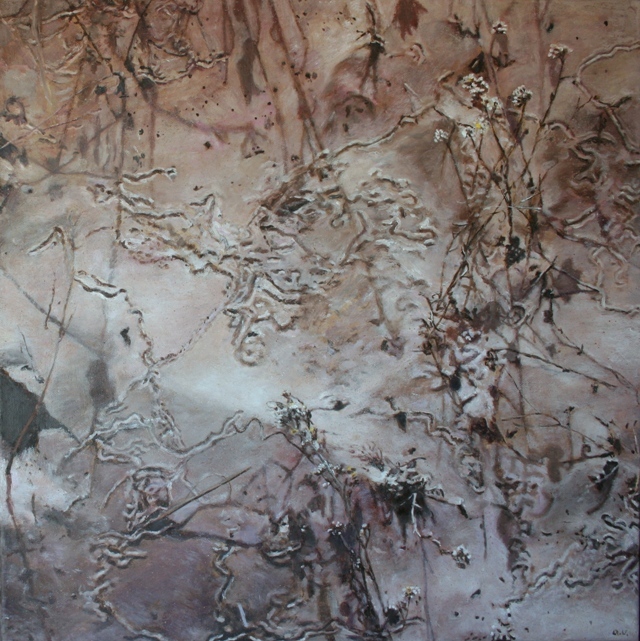 Annelie Venter: Sandveld Landscape with Insect Traces, 2011, oil on canvas, 50 x 50 cm, private collection. Annelie Venter (1955) was born in Namibia and grew up on a large farm. When she was thirteen years of age, the family moved to Potchefstroom in South Africa where she finished high school and completed a BSc degree with a diploma in higher education. She has worked as a scientist, a dressmaker, a teacher and an amateur photographer. She is a wife, a mother and a farmer. At the age of 35 Annelie embarked upon her career as an artist when she first enrolled for life drawing classes at the Vaal University of Technology. Since then this incredibly prolific painter has participated in more than 60 exhibitions. Her favourite genre is flower studies, but she excels at still life, portraiture and animal paintings too. She has been invited by the prestigious Casa Labia Gallery (http://casalabia.co.za/exhibitions) to prepare a solo show that will open in May 2015 on her 60th birthday. Erna Buber-deVilliers is a retired art teacher. When Annelie Venter taught science, they were colleagues at the same high school. Erna writes, edits, translates, draws, plays on facebook, researches genealogy, knits, crochets, sometimes paints and is artist Zak Benjamin’s wife and personal assistant. She thinks a lot about art and about being a Christian in the world. 1. Annelie Venter’s forthcoming exhibition at Dawid’ Choice Gallery, 18 Silvela Road, Sandown Estate, Sandton, Johannesburg: opening on Saturday 7 June at 15:00. The gallery will be also be open on Sunday 8 June from 11:00 to 17:00. Thereafter, viewing by appointment. Please call +27 82 492 9777. 3. 8 June – 15 June, Glen Workshop East. Check out the Glen website to see this year's faculty lineup, including Eugene Peterson, Over the Rhine, Gareth Higgins, Gregory Orr, Suzanne and Gregory Wolfe, Dennis Covington, Marilyn Nelson, Linnea Spransy, Scott Cairns, Susan E. Isaacs and many, many more. The Glen Workshop combines the best elements of a weeklong workshop, an arts festival, and a spiritual retreat. Find out more.